If I have pants on, I generally have a gun in them. When in shorts or skivvies, there is one (or more) close by. Additionally, I am a fan of the HD magnetic mounts and have a few strategically placed guns around the house for easy access should a need arise and I have need to grab one. I have been carrying for nearly fifteen years and it is more convenient for me to simply leave the pistol on my hip then secure it somewhere when I get home and have to retrieve it to go back out. If I am dressed I have my pistol on my hip, period, full stop. I don't see the point in securing a sidearm in a lockbox or safe when there is the chance, however small, that I may need it in an emergency. It is also worth noting that I wear a sturdy 5.11 belt so I barely notice the extra weight of the P229. Depends...always have one available to hand quickly if at home, if am out around the property, yes. If I'm dressed I'm packing! After my shower around 9 pm everything is locked up and alarm set, a weapon is never far away. I feel naked without something on my side. That's why God made scandium J frames. Anytime, anywhere, any clothing. I do the keep one close when at home. Im always within reach, no matter where I am. Unless I'm showering, I'm carrying. That way I don't have to leave guns all over the house. Yup, just makes life sooooo much easier and it's legitimately always within reach. Makes me think of the John Wayne movie "Big Jake" where the bad guy catches the Duke in the shower. Went to drop the trash off at the curb this morning around 0300. Couldn't sleep. Heard some yelling, cops and a bird overhead. Walked back in and about an hour later on the news, some tool either pulled a home invasion or settled a debt. One shot and taken to OU Med. This in what was supposed to be a pretty damn safe neighborhood. So to answer your question, yes! If I am not in bed or in the shower then I am dressed in clothes appropriate for leaving the house. Because I am always dressed (aside from the two mentioned exceptions) I am also always armed with both my EDC gun and a spare magazine. While living in Tampa more than a decade ago I had someone come through my front door one evening. Luckily for both of us he was some drunk fool who thought he was walking into my neighbors house but he sobered up real quick because I was still wearing my Beretta 8045. Unfortunately, I dropped the Publix ultimate sub that I had been carrying back to the living room all over the floor. 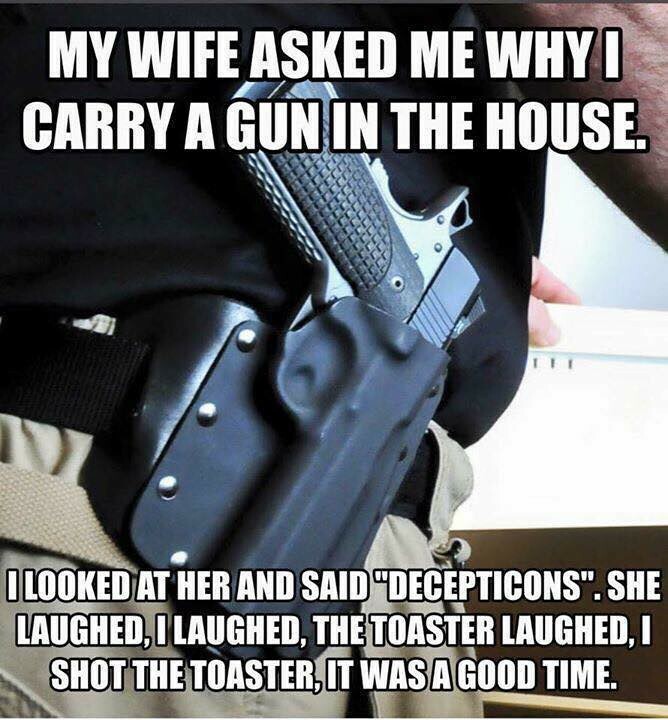 Like I told my wife when we first moved in together, "One hundred percent of all home invasions happen at home." That is why I carry a firearm whether I am lounging on the couch or running my Sunday afternoon errands. "One hundred percent of all home invasions happen at home." , "One hundred percent of all home invasions happen at home." I wish I could get my wife to figure this one out. She doesn't complain about it, but she has this thing with firearms. Raised in Canada by very Liberal parents. She doesn't care what I do with them, but will not partake in them. What's funny is more times than I can remember, we were in a situation were the pucker factor was about 9.5 and she looks at me and says "I sure hope your carrying"
My wife found herself in one of those situations a few years ago. She joined some co-workers for dinner and while they were leaving the restaurant there were some unsavory looking sorts in the Sooner Mall parking lot. One of her co-workers, who had for years been critical of my wife for having a carry permit, made a comment about how she hoped my wife was armed. Of course, when my wife pointed this out later and offered to take the co-worker shooting the woman was dismissive of the whole situation. Some people just don’t want to take on the responsibility. I am thankful that my wife was raised by a cop and has no illusions about the world we live in, even here in the great state of Oklahoma. Always carry at home or have a weapon very close (same room) or both.